"Kathleen Ann Erwin, Westbrook College, Class of 1977"
Westbrook College student Kathleen Ann Erwin, Class of 1977, was a Dental Hygiene major and a Day Hop. 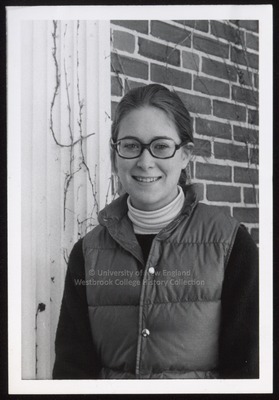 For her senior class candid photo, which appeared in the 1977 Tower Yearbook, she wore a white turtle neck jersey, a dark crew neck sweater and a quilted, puffy vest. Her hair was long and pulled back behind her ears into a ponytail. Kathleen stands in front of a brick campus building with wide white/off white exterior molding.